Gillian Laidlaw talked to Barry Ife, the school’s Principal, about the new facilities and the work of the school. 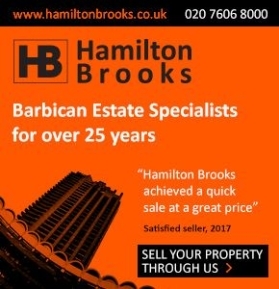 Not only are Barbican residents a few minutes away from one of the greatest centres for the arts in the world but we are also close to a famous music conservatoire which has developed the careers of artists like Simon Russell Beale, Claire Bloom, Orlando Bloom (no relation), Ewan McGregor, Jacqueline du Pré, Sir James Galway, Sir George Martin, Bryn Terfel and Dominic West to name but a few. While most residents must at some time have attended events and performances at the Barbican Centre, perhaps fewer are familiar with what happens next door at the Guildhall School of Music and Drama. We have watched as the new Milton Court rises on the corner of Silk Street and Moor Lane. We know that sales of the tower of flats will help fund additional space for the Guildhall School and a glance upwards in recent weeks suggests that at last the building works are reaching a conclusion. But why are they necessary and what will happen in the new building? The Guildhall School of Music and Drama is unique in London because it offers professional education and development to musicians – both instrumentalists and singers – as well as to actors and the technical staff whose skills are necessary to ensure that a performance can take place. This year 868 young professionals are participating in undergraduate and post graduate programmes. Of these 72 are on the three year undergraduate acting programme, 24 in each year; 108 are taking the undergraduate technical programme with 36 in each year; the rest are musicians of whom about two thirds are undergraduates and the rest postgraduates. As the school was designed to accommodate only 340 students, facilities are severely congested and more space is urgently needed. Milton Court will double the space available to the school but student numbers will remain much as at present. Musicians studying at the school may be singers or instrumentalists and a wide variety of courses are offered. In addition to a four year undergraduate programme some of the specialisms offered include orchestral artistry, chamber music, jazz, composition, piano accompaniment and the highly regarded post graduate opera course. The core programme for actors is the three year undergraduate course but postgraduate options are available such as voice and movement. Technical theatre students work on the school’s public productions learning how a show is put together from set and costume design, to sound and lighting and stage management. They boast a 100% employment rate on graduation. The new facilities in the final stages of construction at Milton Court represent the first phase of an eight year development programme. The old building has a hall for music performances, a theatre which can be organised into different stage and auditorium configurations as well as rehearsal rooms and some very crowded offices. Milton Court will offer a traditional theatre with 3 balconies and a proscenium arch and its backstage technical facilities will be state of the art with a fully automated fly tower. There will also be a small studio theatre and TV studio suite. The concert hall in the new building is big enough to accommodate rehearsals of a full symphony orchestra. The plan is for the music department to stay in the old building and for acting, technical, rehearsal space and staff accommodation to transfer to the new building. 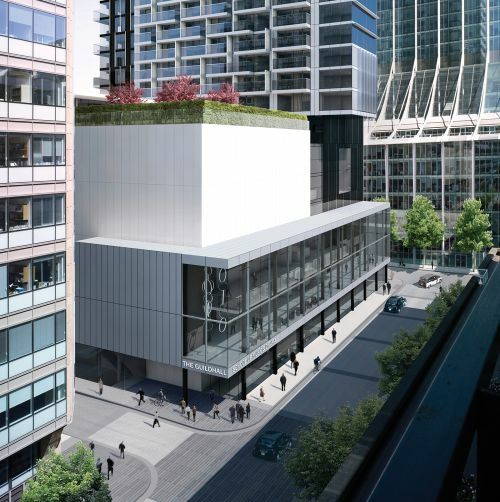 However there will be an inevitable period of transition because as soon as Milton Court is in use refurbishment will begin on the old building. Because the Guildhall School teaches all three disciplines students learn to work in ensembles and collaborate with others, a crucial skill for successful professional careers. In comparison with students at other London music schools the writer also feels that musicians at the Guildhall School have greater stage presence because stage craft is integral to their training. This sets them apart from graduates from other schools and means that they have the ability to go straight to the professional stage. They may even start their professional careers before they graduate. During 2012, thirty technical students worked at the Olympic ceremonies and the Queen’s Jubilee Concert. One of the major ways in which actors and musicians learn their craft is by performing in front of an audience. If you have attended any of the plays or operas, you may be surprised that there are usually only 4 performances and with a change of cast too. Students are at the school to learn how to perform; the show is part of the learning process. When they have performed a show once or twice they are ready to move on to the next show. A concert will take place once, as happens in the real musical world. The Guildhall School also benefits from its proximity to the Barbican Centre and its facilities and resident companies. The London Symphony Orchestra’s principals give master classes and there are opportunities for instrumentalists to train with the orchestra. Earlier this year the school used the Barbican Theatre for its production of the opera, “A Midsummer Night’s Dream”. 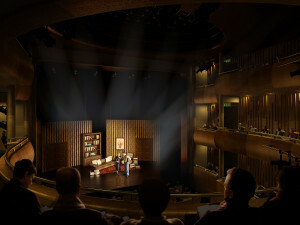 The Barbican Centre will also use the new Milton Court as an extension of its own spaces; the smaller concert hall will present around 40 concerts a year acting as a complementary medium sized space to the much larger Barbican Hall. Recently the school has also combined its back office functions like finance and box office with the Barbican Centre thus saving the school money and making it easier to book tickets for school performances. Milton Court has its formal opening on 26 September in the presence of the Lord Mayor. The development will have cost £89m; this is offset by the sale of the 284 flats and a contribution from the City of London Corporation. The Guildhall School of Music and Drama had to raise over £13m and it still has nearly £4m to go. Its “Take Your Seat” campaign, which invites sponsorship for seats in the new theatre and concert hall, will make a major contribution. On an ongoing basis residents can support the school by attending its performances, becoming a “Friend” or sponsoring individual young professionals. The new facilities at Milton Court join the Barbican Centre, LSO St Luke’s, the Museum of London and the original Guildhall School theatre and music hall to create an even more exciting cultural offering in our part of London.